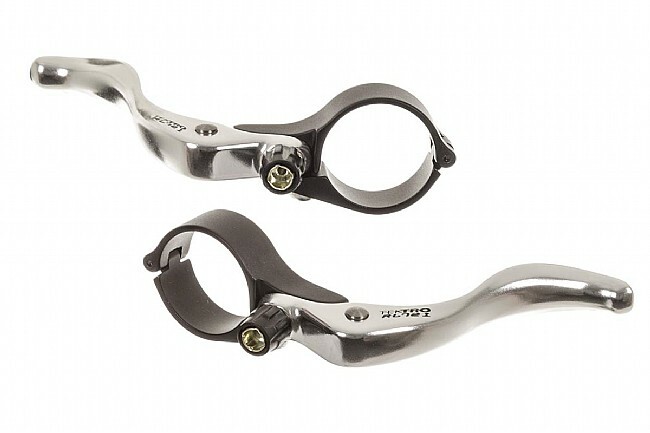 In-Line Cyclocross Levers provide brake control when hands are positioned on the tops of drop bars. Forged aluminum lever and bracket. The Tektro cross lever offers top quality performance at a great price. 2 piece hinged clamp for easy installation. The levers have a handy barrel adjuster and weigh a minimal 100 grams for the pair (31.8 clamp). 2 levers are included. 24.0mm, 26.0mm, or 31.8mm Clamp. Black.